© All formats-, authors-, intellectual ownership-, project-, and project development RIGHTS of this 'brief explanation' and RTPK concepts & formats are now in one hand: that of Casting International; they are in sealed envelopes registered by an independent third party through data-time codes, ready for marketing by Lawyer's nota acts and for proof of originality. II): The Aim of RTPK. III): The means and operation areas of RTPK. Attachment 1): A global schedule of the RTPK-system. Attachment 2): An organigram of the Holding to be established. an original Audio-Visual + ICT concept titled 'Reality-TV of the Purple Peace Keepers' (RTPK). within international development co-operation in a commercial manner. To help solve universal problems. Our mission is to help make the communication of United Nations organizations more efficient and more effective. Our vision to achieve this is by training our ‘own’ video production teams that afield can serve as eyes & ears. which provides the UN afield with eyes and ears in ‘real time’. The aim is the creation of an organized military set up, without guns but equipped with non-lethal weapons and uniform. 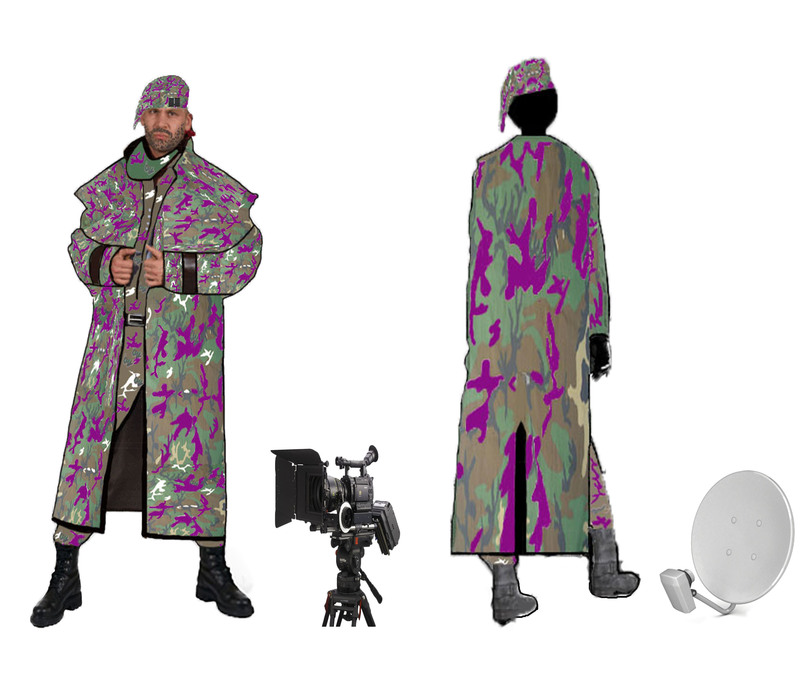 conscripts during the Cold War, and which has been innovatively adapted for training such teams in order to realize many UN-film assignments. Only trainees who have completed their traineeship with an 8, 9, or 10 (Dutch Educational scale 0-10) are offered time contracts. during film productions with a duration ranging from 1 week to max. 3 months. 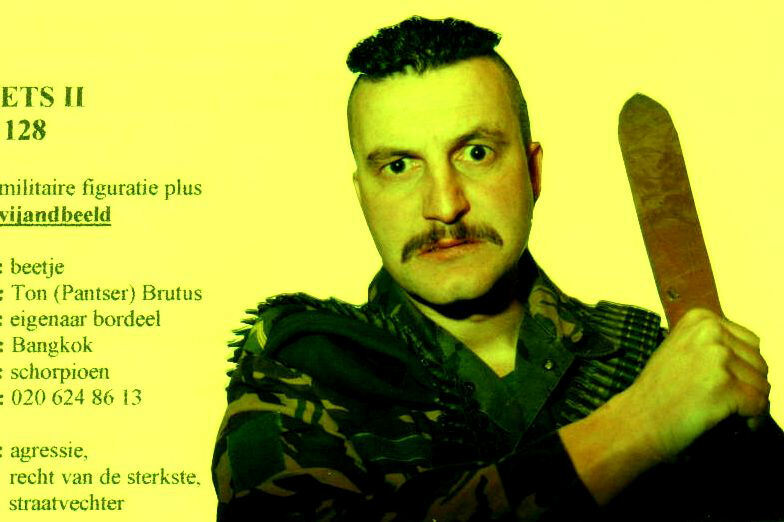 High (warzones, organized crime, anticorruption projects). The teams are multi-disciplinary in terms of their educational composition allowing them to work as a self supporting entity. The freelance time contracts allows for a noncommittal to missions, but there are many needed with different levels and training. State of affairs today (after 5 years): 120 persons available for CREW time contracts and 30 for STAFF time contracts. ☛We take negativisms, and make them positive! 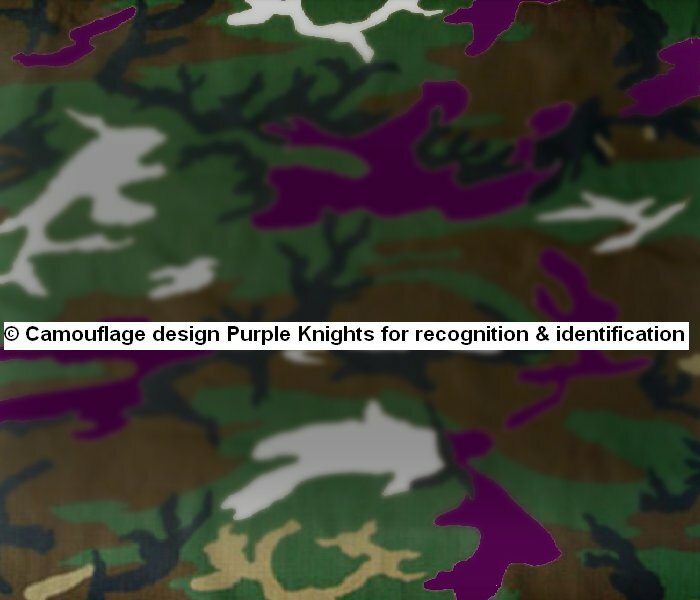 The colour purple of the ‘Purple Peace Keepers’ comes from the mixture of blue (colour of free market trade) with red (colour of planned economies). Blue is also the symbol of love, generating happyness; Red is symbol of compassion, neutralising suffering. These associations are the main drives of these male and female observe-warriors. (so not to be mistaken as another particular army). Also their insignia-symbol ® CLICK HERE on flags and emblems make recognition and identification clearly possible. through which the UN-decisionmakers will better monitor their 'making a better World' operations Worldwide. reducing bureaucracy costs and increase vigour. This name is derived from (near-)real-time streaming video-images. This internet TV-station has 5 channels. Sale of © rights & licensing of formats and programs to other (inter)national media channels. RTPK gives the UN a mouthpiece, generating more support of the (World)civilians. It encourage international cooperations between Non Governmental Organisations, civil societies and companies by liaisons. It also educate, earn money, prevent and advice without moralism. CLICK HERE to read about our vision on solving universal problems. To finance the infrastructure: see businessplan. To finance the productions we use crowd-fundings. through advertisers & sponsors who surf on Worldwide high-ratings. For an overview of all the 5 TV-channels CLICK HERE. For a detailed overview of the Management and Control by Staf-Staf and Oproom CLICK HERE. however the organization is encumbered with too much bureaucracy. The UN-system needs to change in their stilted paperwork, complicated procedures, and a lack of communications. for example refugees, because it focus on symptoms rather than causes. At present the financial costs are greater than the results. Human Rights, peace, 'honest' trade, law and Justice, healthier life and education all these for present and new generations). These are some of the reasons why the RTPK will become a valuable key for the UN. The first idea's for RTPK arose in 1979-1980 when undersigned was working as a lieutenant for UNIFIL in the Middle-East. From 1989 - on: the project was continually researched and developed. into elaborate detailed plans, tested out by proofs of concepts, pilots and websites. internal policies and standardizations of operating-procedures. to produce on running belts. All of the innovative formats, concepts, storytelling films and documentaries are original, with rights available for participations. all the various project developments to be presented on this internet TV-station / new portal of the United Nations. 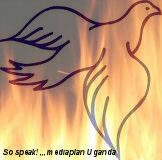 Important is that non-political peaceful state of mind behind RTPK. This encourages awareness of compassion and non-violence methods and techniques through Audio-Visual means. earning money is not the aim, but a necessary means’. I look forward to your reply and will be pleased to discuss any details with you, with the aim of realizing the plan as described above. realizing a more effective and more efficiënt United Nations. The aim of the 'Purple Peace Keepers’ is to establish recurrent, enduring periods of peace more efficiently and economically. 'Purple Peace Keepers' are newly formed hightech observation units utilizing military procedures, materials, outlooks, skills & drills. Their main means are cameras, use of Martial Arts tactics, giving solution advices by showing other point of views (it's about how you look at it). 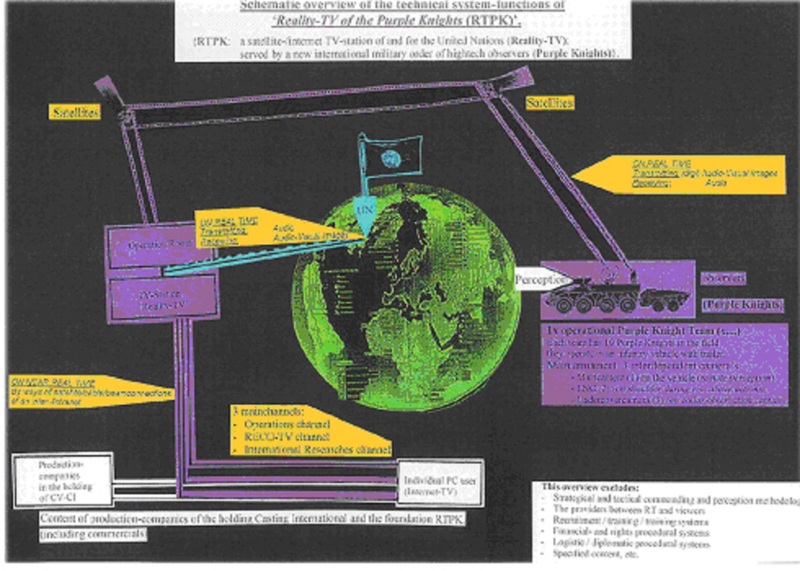 The purpose of the 'Purple Peace Keepers’ is to improve the functioning of many facets of the UN. and under operational command of the UN High Commissioners. This specialized order uses Audio Visual tools as the technical ‘eyes & ears’ of the UN. These sensors observe in real-time operations of all UN-departments. On location the 'Purple PK's register reality with cameras and sound-recordings. The digi-video images are directly transmitted by satellite to the Operationroom. the Operationroom through digital radio interaction. The livestreaming is not the same as that of Twitter / Facebook / Youtube; where civilians are making video registrations by being on location by coincidence. Here professionals are operating, directed by the Operationroom. 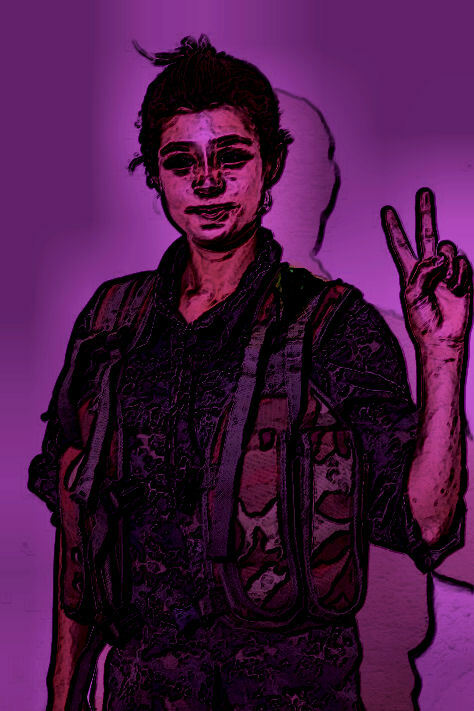 The UN Safety Council can mandate very special observation-operations for the 'Purple Peace Keepers' on bordered territories. and have no firearms but non-leathal 'Special Effects' to defend themselves. All PK-operations are bordered by the golden rules, CLICK HERE to read them. (new original marketing formats)on the internet- TV station ’Reality-TV’. 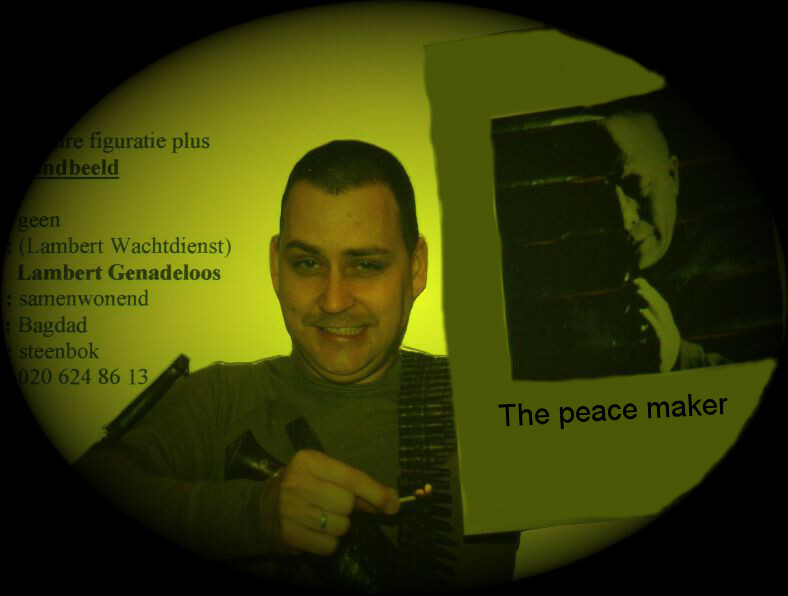 'Reality-TV' and special developed featurefilm formats will finance all functionings of the 'Purple Peace Keepers'. and/or advertisements during programs and during breaks. Advertisers and sponsors will NOT have influences on the content of the programs, they only surf on the viewer-quota. CHANNEL 1: Presents results of PK-trainings by the format 'Reconstructions' (named RECO's). It is an interactive multi-media channel/platform. A) Trade oriented: re-building-up projects; (faction) purpose is to develop local economies. Short visuals of happend incidents in the past as lessons how the Human mind works (in all knowledge domains). Main purpose: education about wisdom, the science about happyness. CHANNEL 2: Presents the format 'International...Researches'. about a certain universal problem item, (fill in on...)per country. 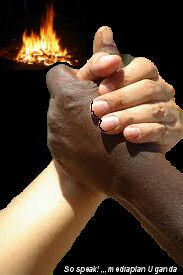 fights against corruption, watermanagement, aging, drugs, landmines, trade, famine, all deseases etc. Main purpose: intercultural education to solve universal problems. CHANNEL 3: Presents logistic observations of AID operations during disasters, incl. prevention, lessons learned, and evaluations. It is interactive and livestreaming. Main purpose: lessons learned for faster and more effective aid against damages of disasters. CHANNEL 4: Presents programms about the climates-, environments- and animal- projects of the UN. It is interactive and live. This channel includes programs with the intention to transform agricultures in the direction of vegetarian visions. CHANNEL 5: Presents peace-operations and anti-corruption projects and organised crimes neutralisations. They are also very effective in international disarmament inspections and controls (NBC). It is live and interactive. The new stars are Purple Knight commanders in the fields. Each one has his/her own team and audience. Main purposes: more peace, justice and fairness. * 'Live' programs may become broadcasted later in time because of safety reasons. All content of these internet TV-programs are new concepts, stemming from original formats, never before broadcasted. peace-keeping, and faster humanitarian (re-)actions. The social relevance of this project is decreasing costs for a structural continuing of peace. Initiation of trade is especially focused upon by RTPK in areas where the UN is already in action ('make trade instead of war'). The total RTPK project is planned to become realised in the basis within five (5) years after the starting-through. Casting International is presently seeking investors, distribution-channels, and advertisers / sponsors to realize step by step RTPK. Detailed financial breakdowns and plannings. The organization of order within the 'Purple Peace Keepers'. The structure of multiple observation units of the 'Purple Peace Keepers'. We welcome your interest and are ready to present further details. Thank you for your attention and your consideration in case of Reality-TV of the Purple Peace Keepers. 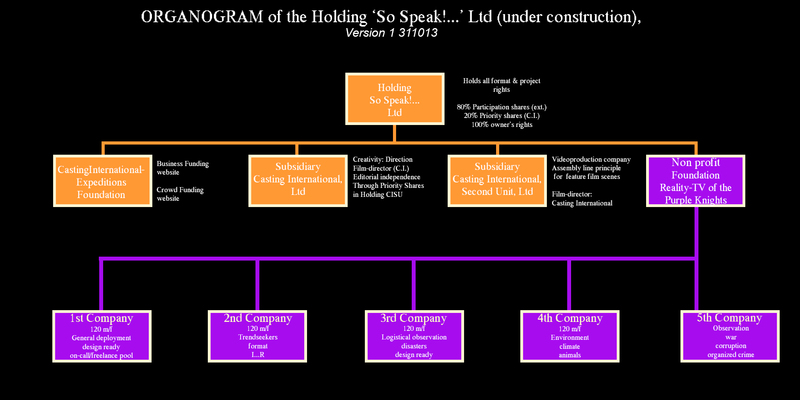 An organigram of the Holding that will realise RTPK (the Holding is to be established). For a detailed overview of all the 5 TV-channels CLICK HERE.